Tea and Savories: We did It! 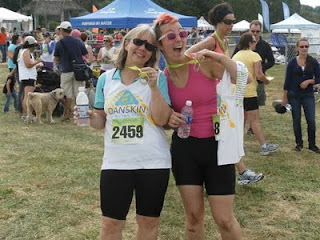 We completed the Danskin Triathlon! We did It! 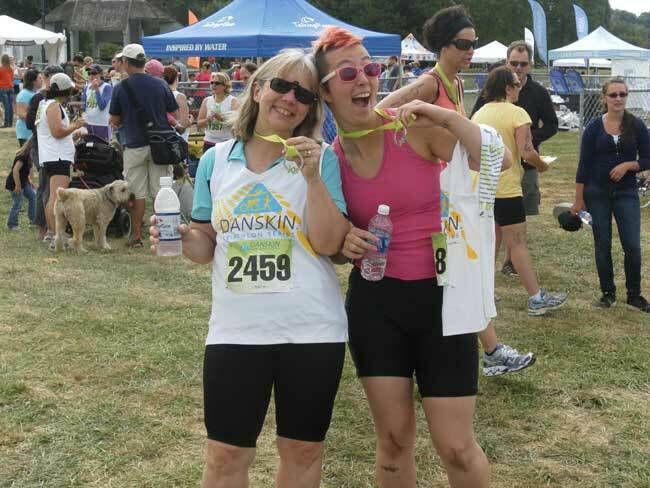 We completed the Danskin Triathlon! For some reason I got nervous Friday night. We picked up our packets Saturday at Seattle Center and got our official race numbers on arms and leg. After attending the information sessions, we dropped our bikes at Genessee Park. Saturday evening I was nervous and slept poorly, waking every hour with thoughts of disaster. Sunday morning, we picked up Jessamyn and made our way to the park where our adoring cheering section, Roger and Micah, dropped us off. First stop, Port o Potties. Long lines. Then to the bikes to set up gear. Lay down towel, bike shirt, shorts, shoes and socks. Put on padding jacket and shorts. Visit Port o Potties. Walk around dodging racers coming back from the swim and moving out on bikes. Visit Port o Potties and head to the water. We're in the last wave of the mixed age group. Every 10 minutes we move forward as the front group enters the water. Visit Port o Potties one last time. Finally, we're urged down to the water and the gates close behind us. Lots of cheering from the sidelines and rah rah encouragement. Countdown 10-9-8 ... 1 and we're off. The water is cold but not bad. Have to swim slowly to allow people to clear out. Some are swimming with swim angels who have noodles. Some women use the noodles for the whole course. People on surf boards and in kayaks line the course providing a haven for anyone in trouble. One well-developed young man has three ladies hanging on the end of his surfboard. Just swim-stroke, stroke, breathe. I keep to an easy pace because I am thinking about the 12-mile bike to come. First turn and don't even look at how far away the second buoy is. A swimmer in front of me turns around and goes to a swim angel. She is panicky saying she can't get her breath. The angel gives her a noodle and breathes with her. Finally, the second buoy and turn to shore. I'm trying the find a clear path and pick up some speed. I wonder where Jessamyn is. We swim all the way up the ramp and I'm up out of the water, one leg done. Others run past to get to their bikes. I stroll to my bike and change form the padding stuff to bike stuff. It's hard to get bike shorts on when wet. Visit the Port o Potties (12 miles is a long way). The ride to the I-90 entrance is easy but here comes the turn and hill and I gear down all the way. I make it without having to dismount. Turn and I'm on I-90. It's fabulous to be crossing the bridge; the weather is perfect, overcast but not cold. Boats move across the water with gulls coasting overhead. By the time I hit Mercer Island I wonder where the turn is. It's a long way through the tunnel and beyond. I'm thirsty but the water bottle is in the pannier. At the turn I stop, have some water and head back across the bridge taking time to enjoy the feel of the air and look of the water. Turn off the bridge and down onto Lakeview Drive. People are picking up the pace here. Back at the transitions area I dismount without mishap and rack my bike. Drink some more water and stop at the (you guessed it) Port o Potties before hitting the last course - the run, or in my case the walk. I start out at a fast walk but start to talk to a woman originally from Venezuela. It's an enjoyable walk with some sun and water cups along the way. At this point most of the women around us are also walkers. Volunteers along the route cheer us on. I stroll to the finish. Jessamyn is there with Roger and Micah to greet me. What was it like? Easier than I thought. I didn't feel tired at all. We went home to shower and then out to Denny's. It was only 12:30. While we were eating I started to get sleepy. That evening I was restless, couldn't really settle. Monday I was on the couch all day, wiped out. The fatigue hung on through Tuesday. Here it is Friday and I'm thinking about taking a walk. You can see more pictures on the Danskin page at the top.